PushPull will be on a (short) tour in the Netherlands and Germany! and we’ll play a completely new piece, featuring even e new instrument prototype! 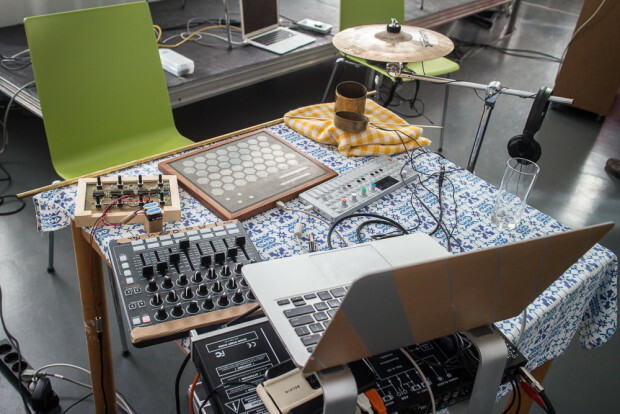 Amelie Hinrichsen and Dominik Hildebrand Marques Lopes will play PushPull, accompanied by Till Bovermann on WaveSetter, a recent instrument prototype developed at the 3DMIN Project. On 14 and November 15, 2015 the Platform for New Experimental Music celebrates its first lustrum with the fifth PNEM Sound Art Festival in Uden NL. In a well-equipped pocket theater (in a typical old transformer building), a platform is offered to various national and international artists. The compact location and the open design of the festival, creates meetings and discussions between artists, organizations and visitors. This leads again and again to new ideas and new initiatives. We are happy to announce who will be performing live this year: Componisten van Oorspronkelijke Muziek NL, Ken Byers UK, PushPull DE, Radio Approxim NL, Renzo Spiteri MT, Studium:Stadt DE and The Feedback Gents DE. There will be shown soundart videos of: La Cosa Preziosa IE, Julian Scordato IT, Dickie Webb NZ, Matthew Schoen CA and Osvaldo Cibils IT and soundart installations of: Lex Raijmakers NL en Thishearbeast IE. The Wood Walk Experience has grown into an app, which can be heard now on 365 days a year in the nearby woods. The first artists will be: Alan Dunn UK, Barry O’Halloran IE, Bart van Dongen NL, David Prescott-Steed AU, David Rogers UK, Sam Marshall UK, Katherine Trimble USA, Osvaldo Cibils IT, Sandrine Deumier and Alx P.op FR and Simon Perez AR. In a combined 9th and 10th edition of NODE+CODE, we will discuss the role of the human body in new music performances. In two lecture concerts, Steim researcher and musician Andi Otto (aka Springintgut) and the UDK Berlin based research group 3DMIN (»Design, Development and Dissemination of New Musical Instruments«) will present their findings and new musical instruments. In a conversation with #NODE15 curators Jeanne Charlotte Vogt and Alexandra Waligorski, they will be investigating the corporeality of the instrumental. Which significance do instruments have for musicians themselves and the audience in times of the digital creation of sound? Do we still have to consider virtuosity as a category to evaluate the relationship between a musician and his/her instrument? Supported by Stiftung Polytechnische Gesellschaft Frankfurt am Main. In cooperation with and ♥ Mousonturm Frankfurt am Main. The location is barrier-free. Posted in Uncategorized on 11. November 2015 by 3d_mvoigt.